Full Lace Front Wigs Q&A: What are they? "What are full lace front wigs?" Hmm... Technically there are no such things as full lace front wigs, but we think we can help by answering some common questions about lace wigs. Full lace wigs are wigs that have wig caps that are primarily made with a lace - there are of course variations such as stretch at the crown, ear to ear stretch, thin skin, glueless full lace wigs and so on (yes, we know, glueless is not a word). Lace front wigs are wigs that have at the front of the hairline only with the rest of the cap being made from either a traditional cap design or variations such as no stretch, open wefts (capless) stretch panels or at the side). The lace used in both full lace wigs and lace front wigs is usually one of the following: Swiss Lace - thinner and less robust; Super Fine Swiss Lace - finer than standard Swiss lace; French Lace - thicker than Swiss and more robust; Nylon lace - sometimes used for lace cap wigs that don't require glue "glueless" (not a real word, we know!) and broadly the same thickness as French lace. Neither type of lace is invisible – Swiss lace is simply slightly less visible. 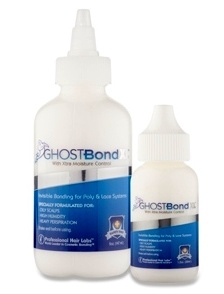 Both full lace wigs and lace front wigs are typically worn with the use of adhesives (tape and liquid) and for those that prefer it, there are also lace wigs that can be worn without the use of lace wig adhesives. Hmm so what do traditional wigs look like? Good question; they look like the image to the right (click on image to enlarge). 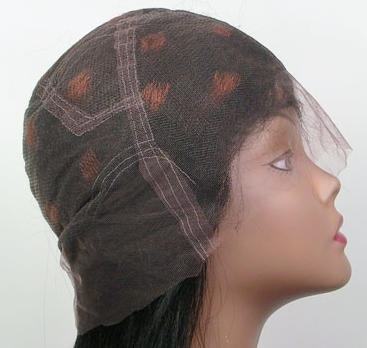 They typically don't have Swiss or French lace as part of the cap construction although do have some areas that look like patterned lace (the kind used in clothing and veils) - especially at the front part of the wig cap. They can also have adjustable straps at the back and combs or clips located on the tabs near the ears and are usually worn with the hair down. "How do full lace front wigs stay on your head?" The second and probably most important difference between lace cap wigs and traditional machine made wigs is that lace cap wigs, usually require some form of wig adhesive in order to be secured to the head...(yes, yes, we can already hear the shouts at monitors after that last sentence, but we promise that we know there are lace cap wigs that don't require the use of glue in order to be worn and we promise to include links to this information...sheesh, tough crowd). 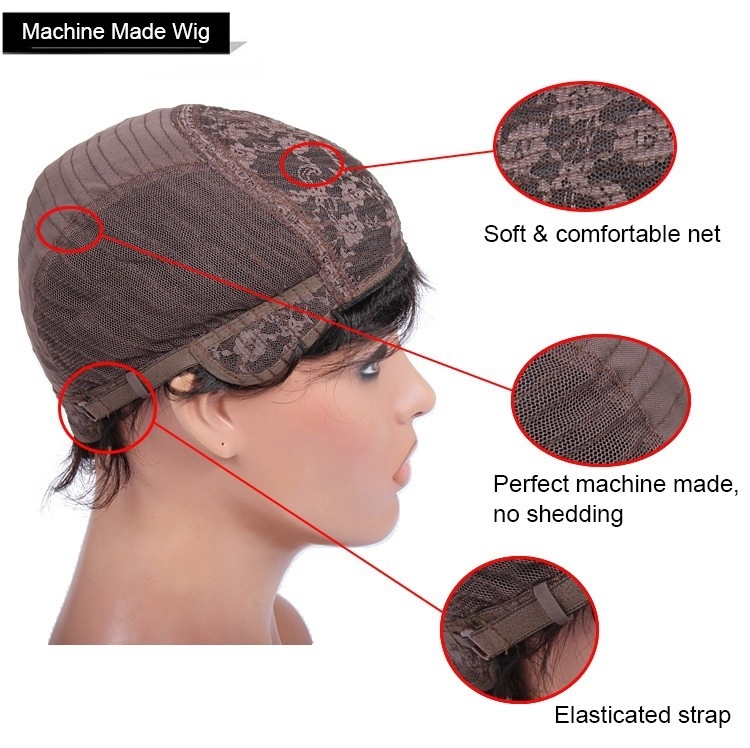 As promised, there are variations of the traditional full lace cap construction so now you can read all about the various lace cap wig constructions. We also promised to mention that there are lace cap wigs that come with clips and straps so that you can wear them without the use of glue; the pretend word that many folks are using is glueless lace cap wigs, but we prefer to call them Wear 'n' Go lace wigs (mainly because we like the fact that the middle word [and] has needlessly had both the a and d replaced with apostrophes - hilarious). Wear 'n' Go lace wigs [glueless] are available as both [no glue required] lace front wigs and [no glue required] full lace wigs... (There, promises fulfilled). That's the run through full lace front wigs and hopefully we've been able to show that the term "full lace front wig" isn't really correct as broad name is lace wig and that the two main types of lace wig are full lace wigs and lace front wigs.